You’re alive and well, things are going good, life is going your way. Believe it or not, it might be the perfect time to preplan your funeral. Yes, that’s right, planning for your passing. Planning now may save you and your loved ones thousands of dollars. A prepaid funeral plan isn’t as much a product as it is a strategy. It’s simply taking steps to lay out (and possibly pay for) everything connected to your funeral. Depending on your family’s and your wishes, that could be the cost of a casket or cremation, the service, the headstone, obituary information and sometimes even medical care in your final days. Remember, your funeral will likely cost between $6,000-$10,000 or more. Planning now makes a lot of sense. Experts have differing opinions on prepaid funeral plans but they all agree on one thing—preplan. When you pass away your family will have a lot of decisions to make on top of coping with the loss. The decisions are often complicated financial decisions that the family doesn’t have experience making. How often do they plan funerals? How much do they know about estates and probate? Preplanning your funeral allows your family to put your plan into action with the confidence of knowing that they’re acting on your wishes. They also have peace of mind knowing that the plan was created through research and cost-effective planning on your part. Experts advise creating a detailed plan complete with a suggested funeral provider in mind. That might include a detailed cost estimate that stays on file with the family and the funeral home. Alternatively, leave a detailed plan with the family and allow them to speak to funeral homes in the area. 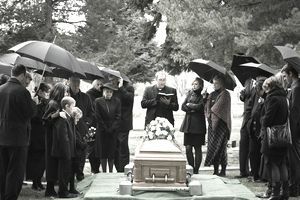 Some people elect to not only plan their funeral but prepay it as well, but experts encourage caution. Some funeral providers offer pre-need insurance, sold as a whole-life policy. The consumer pays into the policy like a regular life insurance policy. When the person passes, the beneficiary receives the payout to pay for the funeral arrangements. Some states require that the funeral home director be named the beneficiary while others do not. Another similar product is burial insurance where the beneficiary can use the death benefit however they choose. Another option is to set up a revocable trust specifically for your funeral. In this case you will often sign a contract to pay for your funeral in installments. The funeral director deposits your payments into an interest-bearing account. At the time of your passing the funeral director, also the trustee, uses the funds to pay for your funeral. If you’re trying to spend down assets to be eligible for Medicaid, an irrevocable trust allows you to prepay your funeral expenses while also shielding those funds from Medicaid. Much like a revocable trust, you can create a plan that pays directly to the funeral director. If you’re using an irrevocable trust to shield your assets from Medicaid, verify that it’s a legitimate Medicaid-exempt trust. Many experts say no. First, what happens if the funeral home goes out of business or over time, gains a bad reputation? It might be difficult to get your money back. Second, the death benefit from the insurance policies offered through funeral homes is almost always significantly less than the premiums you paid. And keep in mind that if you pass away within the first few years of the policy, the insurance company may not pay any of your funeral expenses. It’s not hard to find stories of families that paid for funeral arrangements at another funeral home not knowing that the person prepaid their expenses somewhere else. Also consider that if you pass away while traveling or otherwise away from home, you may have a tough time getting a refund. Setup a Payable on Death account. This is an account set up through your bank that allows the designated beneficiaries to receive the money in the account when you pass away. Because it works just like a regular bank account, you can make deposits as often as you would like. The money will gain interest income over time without the fees and complication of insurance policies. Hint: Don’t name a funeral director as a beneficiary. If you do nothing else, plan your funeral but don’t pay for it. If you want to prepay expenses, experts advise prepaying by saving the money on your own instead of through a funeral home. If you want to prepay through a funeral home, ask a lot of questions to make sure there’s little chance that your wishes wouldn’t be carried out once you pass.